In 2017, Cheng Ju, a college graduate majoring in industrial design, completed her professional project—a service center in Dashi Village of Chongyang County, central China's Hubei Province. However, she did this not for a client, but for the local community in her role as secretary of the village branch of the Communist Party of China (CPC). Occupying 2,300 square meters, the service center is a multifunctional complex in the shape of a traditional Chinese courtyard. The village committee office, as well as a clinic, training school, gym, library, cafeteria, and activity center for women, children and seniors are all enclosed within. "I want it to be a gathering place that everybody in the village loves to come to enjoy," Cheng told Beijing Review. She paid attention to every detail of the complex to ensure that it is both comfortable and pleasing to the eye. The stools in the service center, for example, are each 25 centimeters wide. "It is comfortable for people to sit on for a long time without feeling tired even though it has no back to lean on," Cheng said. 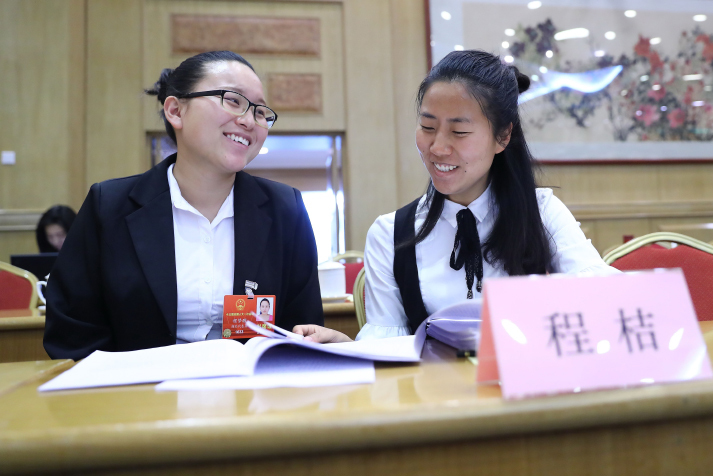 After working in Guangzhou, the capital city of south China's Guangdong Province, for more than a year following graduation, Cheng returned to her hometown and ran for the village Party branch's secretary. "The registered population of the village is more than 1,700, but only about 400 stay there," Cheng said. "Most of the villagers, especially the young ones travel outside to earn money. I want to do something to change that situation." During the election, she promised that no effort would be spared in the construction of infrastructure in the village, including building a service center, a road and a bridge. This was no easy task in an area widely known for poverty, with 106 people from 35 households still suffering below the poverty line at the time. Cheng admitted that as an inexperienced village Party secretary, she took many things for granted at the beginning. "The image of a village Party secretary in my mind was as the absolute soul of the village that all the villagers want to follow, as many TV series show," Cheng said. "As a young woman equipped with a good education, I thought I could easily do a good job by bringing in new ideas and advanced technologies." Her imagination of that position was gradually eroded as she began to understand the reality of her daily duties. The villagers sought her help for everything. She was often asked to negotiate family feuds and on one occasion even helped an elderly woman to track down a lost rooster in the dead of night. Yet despite her efforts, many villagers were not convinced that a 24-year-old could bring significant change to the village. She started visiting every household, talking with the local people to learn more about their needs. Initially, the former Party secretary, an older man, would accompany Cheng, but before long she was embarking on these meetings alone. Cheng also had to go to higher-level governments, applying for funds to invest in the infrastructure that the village so badly needed. The outlay for the service center, more than 2.5 million yuan ($395,000), was the combination of funds from higher-level governments and the philanthropy of local business people. In the three years since she assumed the position, a solar power facility and a tea plantation have also been set up in the village. A road has been paved and a bridge built, and every one of the 106 people has been lifted out of poverty. Great strides have also been made toward improving the environment and the development of local tourism resources. "The farmland in our village is quite limited, so we can't rely on agricultural produce for development," Cheng said. "The natural landscape in the village, however, is perfect for attracting tourists." Dashi Village also happens to be the home of an ancient drum with a history of more than 3,000 years. There is a karst cave too, that is currently awaiting development, which is also on the list of future tourist destinations. All these are Dashi's natural assets for developing tourism. "I knew that there was an ancient drum somewhere in our county, but I had no idea that it was right here in our village," Cheng said. "Many other villagers my age don't know this either. It shows that many of us don't know our hometown as well as we think. This is a common problem for young people from rural areas." Now, when the villagers who work outside come back during the holidays, they first go to the service center, take photos and proudly share them on social media. Cheng is confident in her plan to develop the village through tourism. Just outside the service center there is another area of around 3,000 square meters under construction that Cheng reveals might become a tourism center. In order to develop tourism, the first priority is to make the village clean and pretty, and that is why dealing with refuse is Cheng's latest concern. This year, she was elected as a deputy for the 13th National People's Congress (NPC), and one of her suggestions at the NPC was to build a more comprehensive system of garbage classification in rural areas. "The people left in the village are mostly women and seniors," Cheng said. "Garbage classification has the potential to both improve the village environment and create job opportunities for this group of residents," she said. Looking back at more than three years as a village Party secretary, Cheng says she is happy with her choice to take the position. "This job gives me a sense of achievement." Li Jun, another deputy to the 13th NPC, shares Cheng's feeling. After graduation from university, Li rejected a job offer in Chengdu, capital city of southwest China's Sichuan Province, and instead chose to work in his village, a decision that was strongly opposed by his parents at first. "My parents wanted me to find a decent job in Chengdu and never come back as they saw no prospects for me in the village. But I thought differently, and in fact saw more opportunities there," Li told Beijing Review. Born in 1985, Li, Secretary of the CPC Xiuyun Village Branch, Guangyuan City in Sichuan, has been working in the village for almost 10 years. In his eyes, the resources in rural areas in China are abundant but underutilized, and these assets are just waiting for people, especially young talent, to tap into them. Based on the specific circumstances of his village, Li focused his efforts on developing agricultural produce. "When I had just started working in the village, I received phone calls from friends in Chengdu, offering to buy homegrown vegetables and other agricultural produce from rural households." Li said. He soon noticed the commercial potential of this industry and started to connect urban families in Chengdu with individual households in the village for a regular supply of produce. "The urban people can order specific goods and our villagers will deliver them directly to people's doors in Chengdu on a regular basis," Li said. More than 3,000 households in Chengdu have now signed contracts with the village, and some shops have been opened in the city selling agricultural produce grown in the village. "We have created our own brand and now we have a team of about 50 staff members working on this," Li said. The average annual income in Xiuyun Village has increased from a few thousand to more than 30,000 yuan ($4,750), and young villagers are gradually returning to the village to start their own businesses. Li and his team are also working on a larger project selling pork by developing an app which customers can use to pick a pig and watch it grow on a farm. All the pigs have to be raised for at least 300 days, and they also ensure that no bad feed is involved. The pig farmers themselves will upload new pictures or videos of their livestock every day and send them to the customers. "I hope the way we are developing agriculture in my village can be applied to more villages across China," Li said. "Young people are in high demand in rural areas and so I hope the government can provide more financial support for those who want to start businesses in the villages." Cheng Mengxing, a 28-year-old businesswoman from Sanjie Village, Yingcheng City in Hubei Province, is also an NPC deputy. She says that right now money is an obstacle for rural entrepreneurs. "I chose to come back to my hometown after graduation from university simply because I didn't want to be away from my family," Cheng Mengxing told Beijing Review. While studying at university in Wuhan, capital city of Hubei, she missed her village's local noodles. Made from bean and rice powder, the noodles are a staple food in the village but difficult to find in other places. So she decided to promote her village's delicacy. When she started this venture, there were already several small factories in the village making and selling packets of local noodles. "These small factories were dirty and the production process lacked consistent standards. That is why they couldn't make it big," Cheng Mengxing said. "We needed to adopt advanced technologies to produce the original flavor of the noodle and preserve its freshness." Now Cheng Mengxing's factory is the leading producer in the village and has even opened an online shop. Profits however are limited, and she is struggling to find the funds to take the enterprise to the next level. "We can't just focus on the production process," said Hua Qian, NPC deputy and a businesswoman from southwest China's Guizhou Province, who has answers to Cheng Mengxing's quandary. "Packaging, marketing and after-sale service are all very important for rural businesses." Hua started her e-commerce career while studying traditional Chinese medicine in Wenzhou, a bustling city in east China's Zhejiang Province. 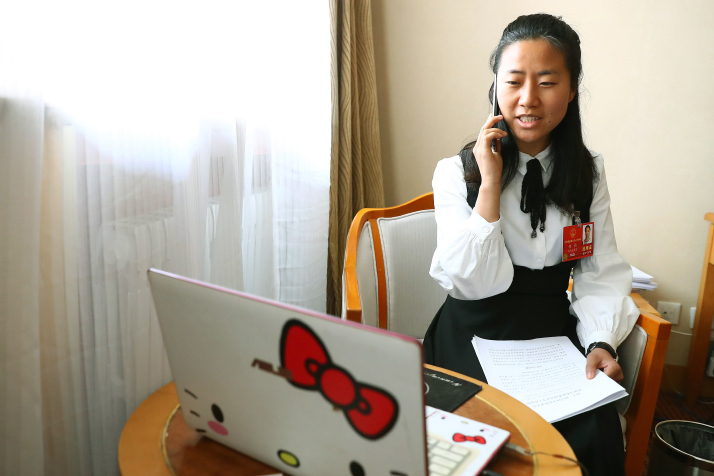 At the beginning, Hua was just looking to make some money until she saw the potential in her hometown. Guizhou is home to many ethnic groups. Ethnic clothes and accessories with the characteristics of different local cultures are popular all around the country. "Yet there were few people selling these kinds of goods online when I started my business there," Hua said. off-line distribution channels, marketing and improving services for their customers. "A mature business line is a must for rural business development," she stressed. 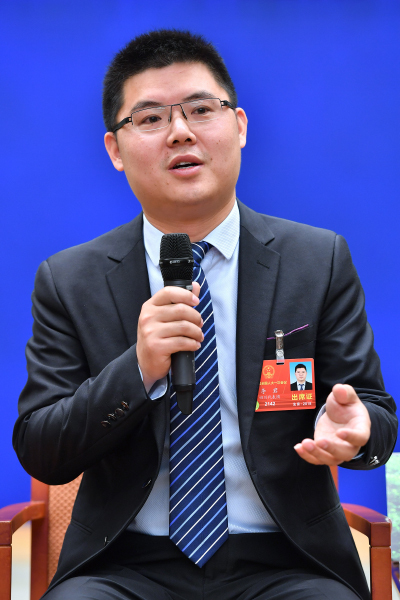 Ma Baozi, Secretary of the CPC Dahuang Village Branch, Baofeng County in Henan Province, has been exploring unique methods of rural development. 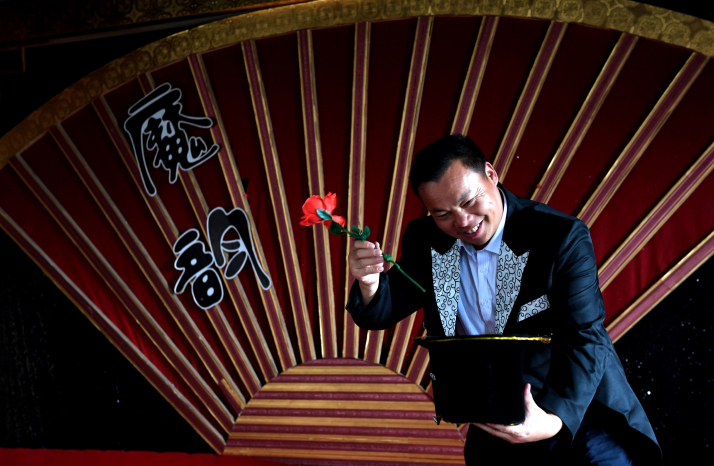 With a history of magic shows dating back more than 1,000 years, Baofeng County is a well-known center for magicians in China. "Half of the magicians in China are from our county," Ma said. Ma himself used to tour the country with his own magic troupe. When the village implored Ma to return and run for election as the village's Party secretary in the 1990s, he hesitated as he was making good money as an owner of a magic troupe having hundreds of people. Ultimately, however, he decided to go back. "My hope is to help everybody in the village to earn good money," Ma said. "That was my promise during the election." Ma opposed ideas to develop the village through tourism or agricultural production, as many villagers were away touring in magic troupes of their own and there was almost nobody working the land. The village itself also offers little in the way of tourist attractions. "The development of our village has to be different," Ma said. "In the past, most of the places we visited on magic show tours were in rural areas where all the local people would come out to see our show. Our performance itself was free but if we sold some small souvenirs with it, then we could make a fair bit of money." He then suggested villagers carry merchandise with them when performing in other places. Now there are more than 2,000 such magic show troupes from the village, and their sales can reach 300 million yuan ($47.5 million) each year. Those left in the village are also getting involved, as the village has now grown into an exchange center for magic merchandise and books in the north of China with annual transactions of 1.5 billion yuan ($237 million). "Now most of the young people in our village choose to stay in the village and many of those working in other places in China have also come back to settle down," Ma said proudly. "We are now planning to take this exchange center online and hopefully it will bring even more business for us." Ma also said that more than half of the villagers can now do magic. "This is the tradition of our village and I plan to set up a museum of magic as well as a performance center to attract more people." Ma was elected as an NPC deputy this year and is happy to see that many more policies aimed at energizing rural areas are being released at the NPC annual session. On March 8, at a panel discussion with deputies from east China's Shandong Province during the First Session of the 13th NPC, President Xi Jinping said that the quality of socialist modernization and a moderately prosperous society will be determined by agricultural competitiveness and by rural environment and incomes. Xi urged local authorities to energize rural industries, increase the incomes of rural residents, alleviate poverty and enrich rural life. This is a continuation of the boost for rural areas after a vitalization strategy was brought up at the 19th National Congress of the CPC held in October 2017. "With more support from the Central Government, I am pretty sure that the future of China's rural development will be promising," Ma said.